We were leaving dinner when I found $50 on the street. Photo credit: Greg Dunlap, CC BY 2.0. We briefly lamented that if only we’d discovered the money before we spent $58 on dinner, we could have had an even nicer meal. “Well,” I said, “I guess we each just made $15!” One of my friends said I should keep it all, since I found it. My other friend suggested I use the money toward the New Year’s Eve party we were planning. The money felt a bit like a burden. I wanted to divide it up as soon as possible, to make it not just my responsibility. We wandered into an antique store, where there was a toy donation bin. I thought about dropping the cash inside, but I figured throwing loose bills into a box full of Legos and stuffed animals wasn’t a great idea. It might just get lost again and be useful to no one. Then we went to a diner, where I used the street money to pick up the $10 tab for two hot chocolates and a root beer float. The diner sold an array of scratch-off lottery tickets and had a Powerball machine. I said, jokingly, “What if we spent the rest of this on lottery tickets?” I almost never play the lottery. I purchase Powerball tickets only when the jackpot reaches some new all-time high and it’s all everyone is talking about. But, emboldened by money that wasn’t mine and loopy from too much sugar, I bought $10 worth of instant games and $10 in Powerball numbers. In our booth, we used a nickel to do the scratch-offs as we talked about what we’d buy with our winnings. (We settled on a chain of private islands, one for each of us, close enough that we could take boats to each other’s islands.) All of the tickets were losers. A few days later, I spent the remaining $20 at Trader Joe’s on frivolous snacks for New Year’s Eve. I selected a soda, caramel chocolate popcorn, cheese puffs, cereal bars, lemon cookies, and a snack mix. It was more food than our small group needed, but it was fun to pick out special treats that we probably wouldn’t have bought with our own money. Ultimately, the money funded a few nice memories. We had, as I jokingly called them, “sweet drinks” at the diner. We had a few minutes of fun dreaming up what we would do if we won millions of dollars. We had our New Year’s Eve celebration, which involved an assortment of fancy snacks paid for by some stranger. It’s been weeks since I found the money, but I still feel kind of weird about the whole thing. I keep going back to that moment where I discovered those three bills laying in the road and wondering what, if anything, I should have done differently. Part of me feels like that money wasn’t mine to spend, and maybe I should have just kept walking. Or I should have donated it. 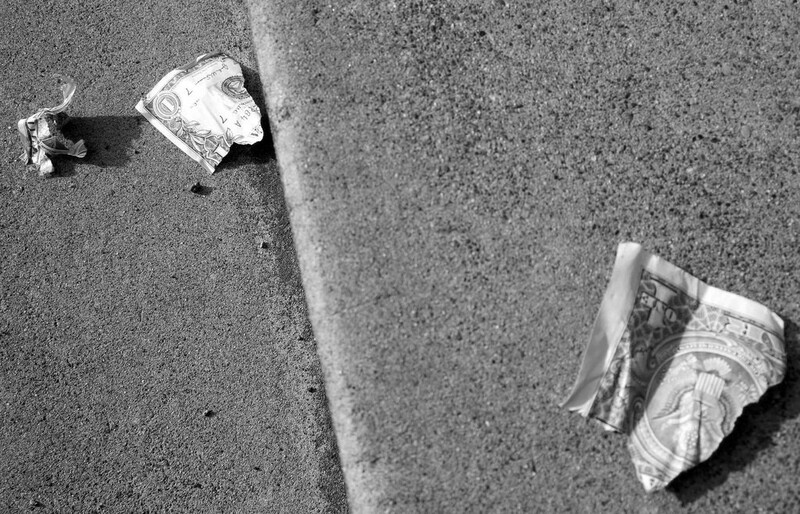 Or maybe picking it up was the right thing — maybe it was one of those holiday pay-it-forward gestures that you hear people do this time of year (though I would imagine if that was the case the money would have been in an envelope or something, and probably hidden somewhere more interesting). Or maybe I’m being too hard on myself. I would be pretty upset if I lost $50, but at this point in my life, it is not a make-or-break amount of money for me. It’s more than I usually spend on a whim, but it’s not a huge deal. I am lucky to be in this position. I know there are so many people who would have been more grateful than I was to find that extra cash, who would have seen that money as a lifeline. I saw it as fun bonus money that could be spent on silly things. What is the ethical thing to do when you find money on the street? If the money was in a wallet, I would have turned it into the police, or tried to contact the person myself. If the money was on the floor of a restaurant, I would have brought it to the manager. But out in public, with no one else around, are we supposed to default to “finders keepers?” Should I have brought the money to the police department, even though there was no way to identify who lost it? Has anybody who has ever lost money on the street even thought to ask the police department if anyone turned in any cash? The only time I remember losing money was one weekend when I was home from grad school. My mom gave me $30 for an oil change and I misplaced it somehow. When I realized it was missing, I cried. I was wearing a vintage jacket that had a torn lining in one of the pockets, and I remember thinking that the bills must have somehow slipped through the hole and were trapped inside the jacket. But they weren’t there, so then I scoured the interior of my car, thinking it fell between the seats. After feeling sorry for myself for a few minutes, I went about my day. I paid for the oil change with my own money. I went home and sewed up the ripped lining in that jacket. I figured the money now belonged to someone luckier than me. I hope the person who lost that $50 didn’t miss it too much. I hope they were wealthy, out on the town, and drunkenly shoved loose money into their pocket on their way back to the bar from the ATM. I hope when they discovered it missing, they shed no tears, shrugged it off, and put their drinks on a credit card instead. After the holidays, I donated $50 to an arts organization in the town where I’d found the money. I still felt unsure of how comfortable I was with how I’d spent the cash (which wasn’t necessarily mine to spend), so I wanted to do something to restore some kind of balance. I know that’s not how the world works, exactly, but doing something altruistic with an equivalent amount of money helped ease my conscience and will do something good for a town that was the site of a fun evening. Kerri Sullivan is a writer and librarian from New Jersey. She writes a TinyLetter about loss and is pretty into Instagram. This story is part of The Billfold’s “Resolve” series.